One of the restaurants in our South Orange County area that I have frequented often, by pure craving, is Tutto Fresco – located in the beautiful foothills of Rancho Santa Margarita as well as a fun location in Orange (a must stop prior to an Angels or Ducks game! Bring your Angels/Ducks ticket and you can receive a free appetizer or dessert too!). Tutto Fresco, translated to “everthing fresh”, says it all. Their ingredients are always so “totally fresh” and carefully and artistically blended to be appealing to the eye, as well as evoke your taste buds. I sat down with owner, and Coto de Caza resident, Debbie White (co-owner with husband, Steve White) the other day over an amazing lunch at Tutto Fresco/RSM to discuss their restaurant philosophies. The true food artist and one of the main ingredients to Tutto Fresco’s success, is Dan Johns — both chef and general manager. Dan is passionate about the experience he wants his guests to have. Along with his sommelier talent (buying and selling premium wines that compliment his clientel’s taste, both financially, as well as, of course, complimenting and enhancing the food), and his creativity with the menu (always a seasonal menu in addition to their main menue which is full of fresh variety), he truly knows his purpose in this life. Dan’s foodie talent, along with Steve and Debbie White’s combined years of experience and consulting in the restaurant industry, makes this Tutto Fresco team, top notch. The best part?! They all truly enjoy what they do! You can feel that sentiment through their plates and willingness to please their customers. For example, Dan, on an occasional busy Friday or Saturday night, will take a platter of samplers out to the patrons who are waiting for their table. This team gets involved with and gets to know their customers — that truly is an added bonus in my books and a key ingredient to success. Debbie, you can tell, had a say in the décor – very tastfully accented and comfortable, with a touch of an Italian flair. Patrons have a choice to sit either indoors (like a family living room) or outside on their patio where you can watch the hustle and bustle of RSM life. City Hall is across the street and the movie theater is across the way, making it a very convenient place to eat prior to a local event, or movie showing. Life is full of choices and when it comes to restaurants, we don’t want to waste our time and money, and we expect the food to be amazing every time. Restauranteurs really need to nail it, knowing that they are pleasing most of the people, most of the time. At Tutto Fresco, I would bet you’ll be pleased all of the time with innumerable options of: appealing appetizers, pasta dishes, vegetable dishes, great salads, tasty soups, paninis, wraps, sandwiches, chicken, fish and seafood, lamb, sausages, pizzas, calzones, desserts (awarding winning carrot cake! ), etc. etc. Their menu is quite extensive. Their three most popular dishes are the Baked Sausage Lasagna (true “man food”), Rigatoni della Camera dish, and the Spinach Ravioli. New recipes make their debut on the seasonal menu, then, based on consumer interest, they will pass and make it on the big menu. And I must say, the menu is growing!!! Dan personally came out and started us off with one of his many new creations: Bruschetta Parmesan Nest, a beautiful presentation, easy to eat, and full of parmesan and fresh tomato flavor! Always thinking and creating, Dan came up with another Bruschetta al Pomodoro served with grilled corn and home-made guacamoli – a must try. Next, we tried his Mini Fig Pizza which is a wonderful combination of sweet figs and savory pancetta with Norwegian goat cheese – great bold flavor with a balance, very, very good and one of my favorite flavor combinations. Debbie ordered the Blackened Shrimp & Peach Salad (no photo here, we ate it too fast! Oops!) – a great summer choice, and the shrimp was done just right. And finally, we had lamb. I must note, that I was honest, and told Dan and Debbie that I am not a fan of lamb, but they insisted I give it a try. 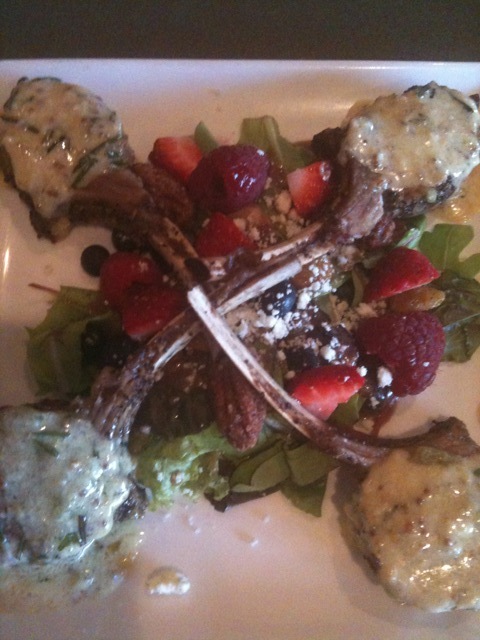 From the appetizer menu, another beautiful presentation of four Macadamia Nut Baby Lamb Chops with a macadamia pesto and mustard sauce – I was impressed and I WILL order it again, it was that good. I’ve been won over! Menus everywhere seem to be declaring the American consumers’ cry for “health conscious choices”. Tutto Fresco hears you and has developed healthy menu items, including a Fitness Wrap and a great Tortilla Soup, just to name a few. Not only is Tutto Fresco a truly great destination for wonderful family dinners, sporting lunches/dinners, wedding showers, baby showers, birthday celebrations, Mother’s Day brunches, but also a wonderful place to have a fund raiser for a school, a team, or helping someone out in the community. Debbie and Steve White, are always eager to participate in community events and fund raisers. Just last week at the restaurant, the Santa Margarita Catholic High School Girls Cross Country families held a successful fund raiser dinner for their team. Fund raising dinners have helped out Tesoro High School’s football team, drama group, as well as Tijieras Creek Elementary and St. John’s schools. We held a very successful dinner fund raiser to help out the Fallon family last year when our friend, Luke, had sudden brain surgery; Luke showed up and was greeted by familiar and unfamiliar faces in support of his recovery. (I’m happy to report that, a year later, he is doing more than amazingly well!). Debbie and Steve are more than willing to give back 20% of lunch/dinner sales (dining in/take out orders apply), Mondays-Thursdays. Give Debbie a call to set up your fund raiser today: (949) 858-3360. 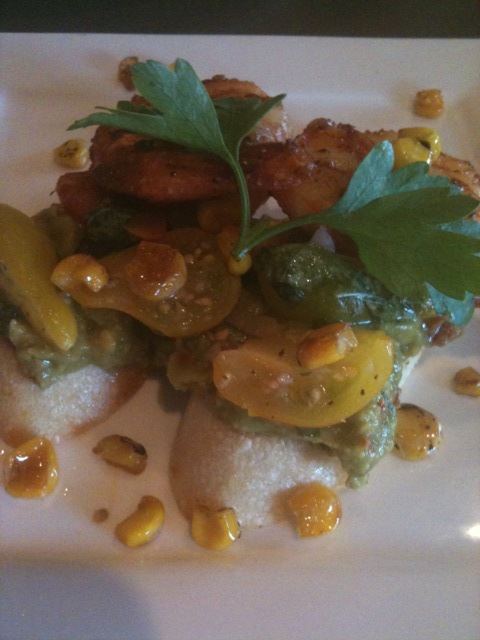 All in all, I can’t say enough about Tutto Fresco – amazing food for all occasions. 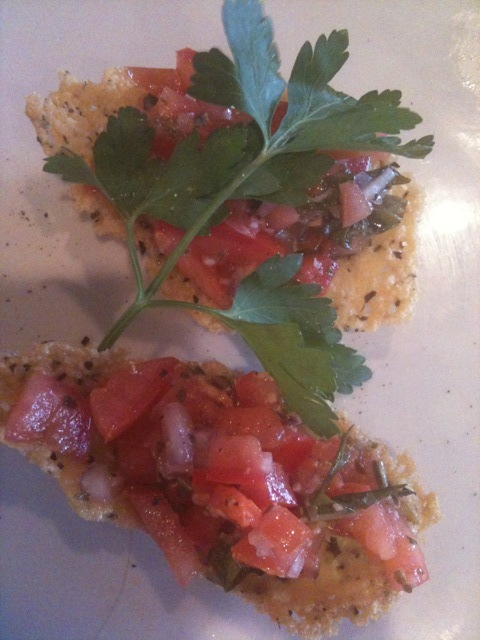 Contact me on my blog and tell me about your favorite menu items! Trabuco Oaks Steakhouse – Cowboys Welcome!